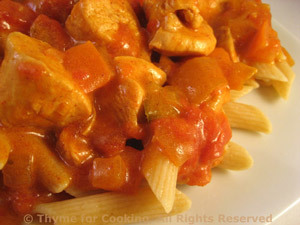 Chicken Paprikas, Thyme for Cooking gourmet menus. This is based on a recipe from the Frugal Gourmet. I modified it to use chicken breasts rather than a whole chicken, cut the quantities down and spiced it up a bit. This is ready in just 35 minutes rather than the original 2 hours. We'll use the rest of the yogurt next week.